How to get events onto your calendar and how to manipulate event data thereafter. Tells the calendar to display resources from an array input. Tells the calendar to fetch the resource list from a remote script. A custom function for programmatically generating raw Resources objects. All of the techniques for specifying resources accept an array of raw objects. These raw objects are “parsed” into proper Resource objects, which are accessible via methods like getResources and getResourceById. Raw resource object are eventually parsed into proper resource objects, which are accessible via Calendar methods such as getResources and getResourceById. You can read their properties or manipulate them via methods. 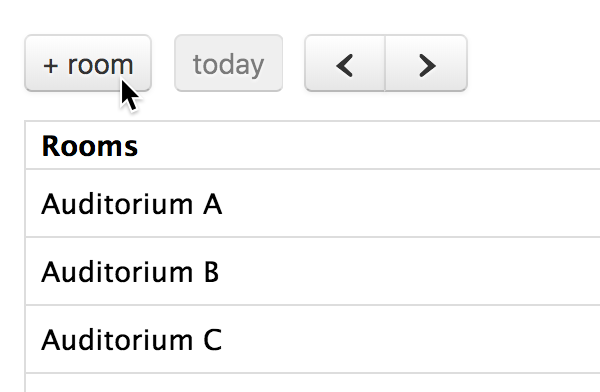 How to specify which resources your events are assigned to. Whether to refetch and rerender resources when the user navigates to a different date or changes the view. Causes the resource data to be fetched and freshly rerendered. A method that retrieves only top-level Resources. A method that retrieves all Resources, including children, as a single flat list. A method that retrieves a specific Resource Object in memory. Allows programmatic rendering of a new resource on the calendar after the initial set of resources has already been displayed. Returns the parent Resource of a child resource. Returns a list of a resource’s child resources. Retrieves a list of Event Objects that are associated with the given resource. Programmatically removes a resource from the calendar. Sets the Resources associated with the given event. Triggered when event or resource fetching starts/stops.